of inquiry, research and immersion, I explore, interpret and distill visual opportunities into solutions that are at once specific, unique and meaningful. As a result, I have produced work ranging from ceramic installations to exhibitions of photography, mixed media and public art installations. My recent work is informed by current events, the effects of mobility and my response to place in an effort to better understand these events or to create a dialogue. Working in series to fully explore the subject, my work is multifaceted and drawn from my own experiences. 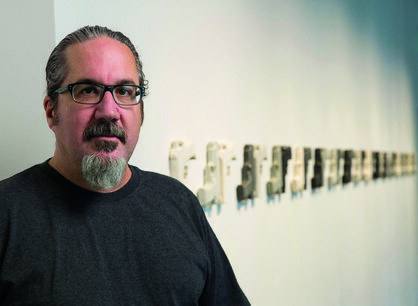 Tom Hubbard’s work spans a variety of mediums and blurs the lines between the disciplines of photography, ceramics and graphic design in which he is trained. Equally comfortable with a camera or found objects, kiln or encaustic wax, Tom creates multifaceted works that are uniquely his own and often bridge the past and the present, the personal and the historical. Informed by his background in graphic design, and believing that the solution often comes from the problem, Tom allows each body of work to evolve naturally without preconceived ideas or forms. With projects ranging from limited edition books to gallery installations and public art, Hubbard moves confidently between both the fine art and design studios. Hubbard’s work has been exhibited widely in both the US and The Netherlands. From Chicago to New Orleans, Washington DC to Amsterdam and Den Haag, Tom’s work has been exhibited in galleries and museums and is included several private and corporate collections. Hubbard grew up in the midwest and lived in New England, The Netherlands and Ohio before moving to Augusta, GA in 2016. This work may not be reproduced or distributed in any form, printed or electronic, without the express written consent of the artist. All copyrights for North America and all ‘international moral rights of the artist’ are hereby claimed and established: 2014. The artist will prosecute to the full extent of the law all cases of plagiarism, appropriation, and intellectual property theft involving this work.